(Previously Secretary General from 1996 – 2011). Educated at Dulwich College and Peterhouse, Cambridge, he entered the ICT industry via STC Microwave and Line in 1968 and, shortly afterwards joined the Royal Naval Reserve as a Communicator (alias trainee radio operator). He moved to ICL in time to decimalise the Group Sales Ledgers before they sponsored him on the two year Masters programme at the London Business School. On return to ICL he ran the tri-partite (ICL-DTI-DoE) planning exercise to produce Computing Development plans for the about-to-be-formed Regional Water Authorities and later served as Comptroller and Business Development Manager for Public Corporation Sector. In 1977 he moved to the Wellcome Foundation as Corporate Planner responsible for R&D, Export Division and the European Subsidiaries (including exercises on the potential of new technologies for improving health care, including of aging populations). At Wellcome he became involved in national IT Policy issues, helping draft the technology policies of both main parties for the 1979 election and in 1981 was the founding "Industry Vice-Chairman" of the Parliamentary Information Technology Committee (PITCOM). After the first “rules” for all-party groups were introduced, he became Finance Executive and helped run PITCOM until 2005. He remains a member of its successor, PICTFOR. In 1982 he joined the National Computing Centre (NCC) to set up a Technology Assessment Service and handle National Issues. Shortly afterwards he was given responsibility for the NCC Microsystems Centre: the flagship "awareness programme" of the day. From 1983-1989 he ran the City C3 Club, bringing together high tech investors and fund-seekers. He was a founding director of the Federation Against Software Theft (FAST), ran studies into reasons for the IT Skills Crisis of the mid-1980s (and the actions likely to be effective) and provided inputs to successive Ministers on how best to advise small firms and encourage investment in innovation. After leaving NCC in 1986 he was retained as an advisor until 1992. He has served on many advisory boards and committees and written extensively on the social and economic impact of new technologies and how to handle them, whether from a political, professional or business perspective. 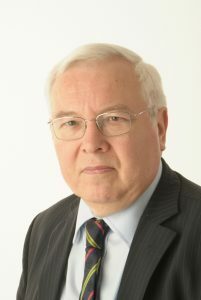 He served on the Council of the British Computer Society for nearly 20 year years and was acting Vice President (Professional) when the Professional Development Scheme was launched, was a founding member of the IT (City of London Livery) Company and “Strategic Advisor” to the Institute for the Management of Information Systems (previously IDPM) from 1993 - 2006. He has also been an external advisor to the High Tech Unit of Barclays Bank (1983-89), Campaign Director for the Women in IT Campaign (1989-92), IT Skills Advisor to the West London TEC (1991-2, a Specialist Advisor to the Information Committee of the House of Commons (1993-4). Since 2008 he has run a Computer Weekly Blog “When IT meets Politics” http://www.computerweekly.com/blogs/when-it-meets-politics/.